Rachel Dunn receives possession during her landmark game against London Pulse. Picture by Clive Jones. RACHEL Dunn marked her 200th career Superleague appearance with a 61-50 win away to London Pulse. 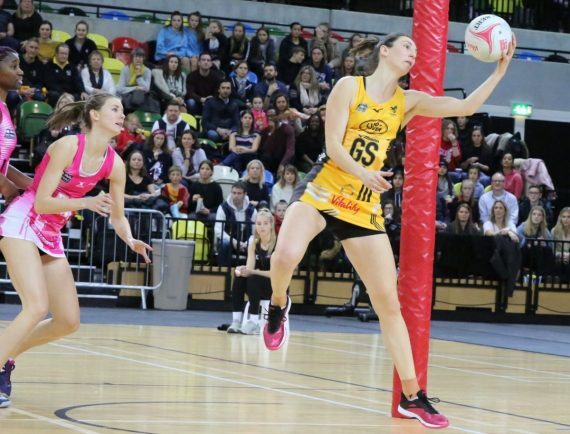 Wasps came back from an early deficit to record victory at the Copper Box Arena, and sealed back-to-back wins to open their 2019 season. Dunn scored the first goal of the game to get proceedings under-way, in an end-to-end affair that saw both sides throw caution to the wind. Bongi Msomi – South Africa’s captain in the recent Quad Series, demonstrated her class and reminded Wasps fans what they had been missing after a season away from the club. Msomi was key in opening up the game and consistently picked out Dunn for scoring opportunities, though the hosts were able to nudge themselves ahead thanks to Shantal Slater’s clinical shooting in the first quarter. Wasps were level after the restart thanks to a Katie Harris goal, whilst Hannah Knights and Fran Williams performed some excellent defensive duties to limit the Pulse’s goalscoring opportunities. The visitors took a three goal cushion heading in at half-time, with Josie Huckle and Sam May introduced to add more protection to Wasps defence. A high-scoring third quarter saw Wasps hold a convincing lead heading into the final quarter thanks to efficient shooting from Harris and Dunn, building on that lead in the final period to secure the win. Head coach Mel Mansfield was pleased with what she saw and praised the impact of her substitutes in helping claim victory. “We knew Pulse were going to come at us today after their last loss and we were ready for that, I was really impressed with how we came back to win the second-quarter after losing the first. Mansfield warned that improvements could be made, but was proud of the performances of Dunn and Msomi against the Pulse. “Rachel Dunn was as steady as anything on her 200th game and it was great to see Bongi Msomi back out there in Wasps colours too. Wasps next visit Surrey Storm on Saturday (centre-pass 6pm) as they hope to continue their winning start to the Superleague season.